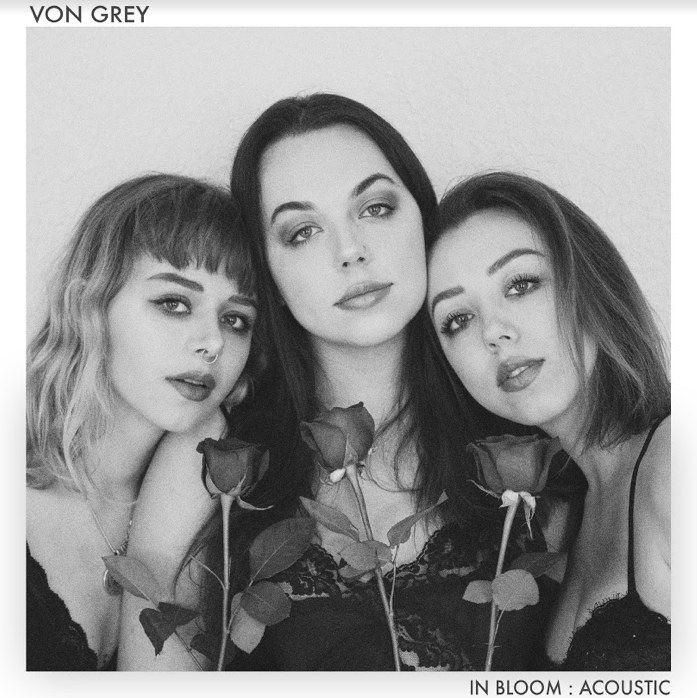 It’s a common understanding that the strongest trees have the deepest roots–in their new EP In Bloom, folk-pop trio VON GREY celebrates their acoustic roots and spreads their wings of independence. The six-song gem features new tunes and breathes life into previously-released ones, all anchored by the sisters’ signature blood harmony, stringed mastery, and gut-punching lyricism. Annika, Kathryn, and Fiona von Grey spent their formative years in classical training, and have used those foundational elements to create moody, synth-infused pop music which has garnered millions of streams online and earned them spots performing on late night television. This time, the band recorded (in bedrooms, in kitchens) and engineered their own album themselves. The final product is beautifully acoustic and without extraneous studio magic which allows their raw talent to shine through brilliantly. On the standout reimagining of 2017’s “6AM,” the trio replaces drums with foot stomps and handclaps, and gracefully swings through a harmony-rich delivery suspended on a sweeping and cinematic blend of violin, cello, and acoustic guitar. “It’s 6 a.m. again, I hate this and I hate you/ Sun comes out again, I love you and I miss you,” they sing, lyrically and sonically relaying the emotional push-pull of romantic love. In “Closer To You,” intensity is cranked to 11 and depth is driven by continuous strokes of bone-rattling low-end cello. “Hold on, I’ll carry you my sister…it’s time to find the path of least resistance,” they cry in triumphant album closer “Dawn,” a timely anthem of support, healing, and hope in the face of vulnerability and victimization so commonly experienced and internalized by women. It’s clear that this band is unafraid to experiment and evolve; in the midst of their exploration of this territory, they acknowledge that in order for architecture to last, the foundation must be firm. With In Bloom, VON GREY shows us that they’re here to stay.